Here in Ottawa, one of our favourite winter sports is ice skating. With the world’s largest skating rink, it’s no wonder! Folks come from all over the world to skate on the 7.8km long rink (Rideau Canal) and enjoy the classic “BeaverTail” pastry. My mother quickly learned to bribe me out onto the canal with those sweet treats as a kid… but then I developed food allergies. Don’t get me wrong, I do enjoy skating the Canal for exercise, but I’m still grieving the loss of eating those BeaverTail treats afterwards. Last year I made my own top-allergen free adaptation (https://epiadventure.wordpress.com/2018/01/26/beavers-tails/) but this year I’ve been too busy skating! Dress warmly! Layers are really important (with the right materials). If you’re contact allergic to wool, you can try adding it as a middle layer, or find a sweat-wicking alternative like Polartec. Fun fact: I over-layered on my first shift and the sweat condensed and froze onto my hard-shell jacket! Bring your own equipment or call ahead to ask about cleaning! I definitely spilled my allergen-safe hot chocolate all over my skates this year, and I wasn’t able to get them totally clean. I don’t share my skates, but it’s something to consider if you plan on renting. Helmets are a fantastic idea on the canal as well, so I bought my own to avoid any lice, allergens, or scented cleaning sprays. Bring allergen-safe snacks with you! The food huts aren’t always open, and they’re so small that cross-contamination is a huge risk. For example, the Beavertails’ website lists tree nuts, wheat, dairy, soy, barley, tropical oils, and sulphites as being present in their huts. Instead, I like to bring bananas, golden kiwi, pumpkin seeds, rice crackers, and safe chocolate chips. Bring something warm to drink! I often forget to bring my thermos and regret it since it’s so easy to warm up with a hot drink. Recently I’ve taken to making safe hot chocolate by pouring 3Tbsp of chocolate chips into my insulated mug, then filling it 2/3 with boiling water. I close it up & shake until the chocolate is mostly dissolved then add my safe milk. This leaves me with a perfect temperature drink that is a bit less lumpy than other methods I’ve tried. Bring wipes! There are often people eating inside the warm changing huts, and this is the easiest way to make sure your hands are clean before you eat. Keep your auto-injector on you and keep it warm but accessible. 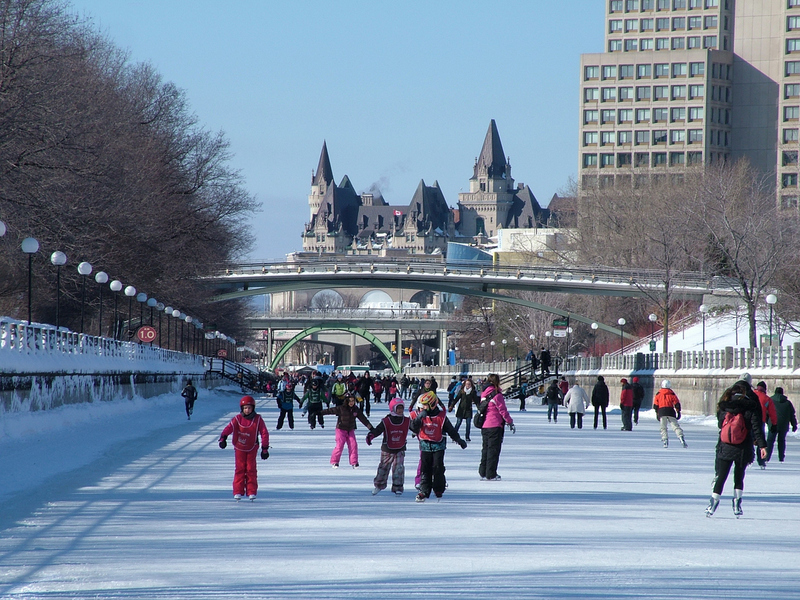 When emergency (911) is called for an incident on the Rideau Canal, the first aiders like me on Skate Patrol are dispatched as well, because there are a lot of people and the ice ambulance is only available during the day on Winterlude weekends. We then transfer to the land ambulances as soon as possible. Fun fact: I wear my auto-injector on the side of my leg so that I can kneel on the ice while helping people. Surprisingly, no one ever notices it so I point it out to my partner and supervisor before every shift.